Broussard's offers what New Orleans does best: elegant Creole dining. About the restaurant: Founded in the 1920s, Broussard's has an honored spot among the grandest of the grand old Creole establishments. 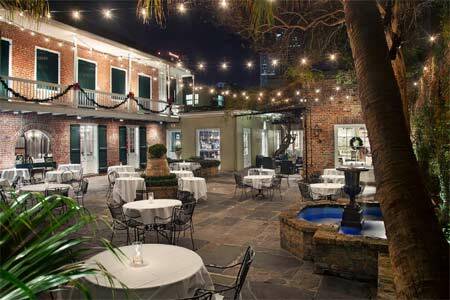 The patio is reminiscent of the storied New Orleans courtyards of yesteryear, elegantly manicured and the ideal setting for authentic French Creole fine dining. The interior features chandeliers and white tablecloths. Food & Drinks: Start off with classics such as turtle soup, or reinvented dishes like red chili glazed fried chicken biscuit with pepper jack cheese, pineapple citrus slaw and sweet potato biscuit. Entrées are as diverse as broiled black drum Rosalie to pecan-crusted grilled pork loin chop. The wine list is carefully thought out. Finish your meal with a traditional bananas Foster. Formally clad waiters are most obliging. Weekends bring a jazz brunch with bottomless mimosas.